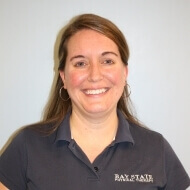 Ali graduated from Simmons College in Boston with a BS in 2002 and with a DPT in Physical Therapy in 2004. She worked in the South Shore area, including Bay State locations in Kingston, Cedarville, and Plymouth, until she moved to Phoenix, AZ where she continued to practice in an outpatient setting. Ali and her family returned to MA in 2012 and she now works in the Plymouth office, inside Plymouth Fitness. Her clinical interests include rehabilitation of patients with a wide range of orthopedic injuries as well as those who are seeking postoperative therapy. She enjoys providing education to ensure full patient involvement in their care. Her treatments include land based sessions with manual therapy as well as aquatics therapy.